1. The Seersucker Suit. A staple in a Southern Gentleman’s wardrobe, the Seersucker has made more of a prominent appearance in the northeast. 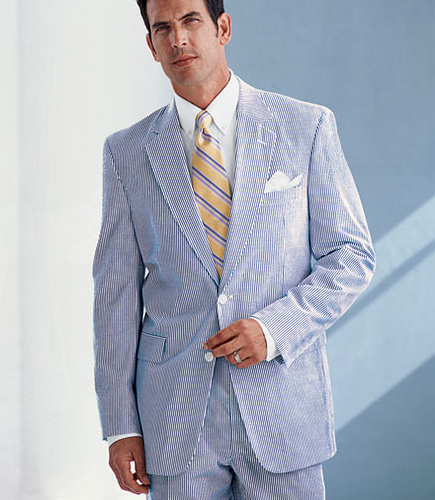 With fabric that breathes well and light colors that give you a casual look- for a casual summer day or a friend’s wedding out on the beach, you cannot beat a Seersucker suit. The fabric typically comes in the form of blue stripes on white, but can also be found in cream or beige. The fabric’s light weight cotton properties make it ideal for summer and allows for some fabulous color schemes! Seersucker is a lightweight, crinkled, striped summer fabric of puckered cotton. The crinkled stripes let air into the fabric to help you keep your cool. While usually utilized within the framework of a suit, seersucker can also be worn as a sport jacket or shirt. Throw in a lighter colored tie, a madras cotton tie or an animal print motif tie, and you’re bound to be a winner! 2. Light Pinstripes Suit – While Pinstripe Suits have conventionally been associated with boardrooms and power brokers, the modern day pinstripe suit is a flexible piece that can be worn across seasons and events. A light colored, pinstripe grey suit is perfect for the summer. A colorful tie against a light pinstripe suit in the spring / summer can give your ensemble some extra Pop! 3. Linen – What makes linen so attractive is that in addition to lightweight properties, linen as a fabric is very cool and absorbent. Linen’s wicking properties are far superior to many other fabrics, wicking away up to 20% more moisture than most fabrics do. Hence, you can see why it would be an ideal fabric choice for a summer time suit! Enhance the look of what are traditionally light colored linen suits with a colorful shirt, to give your ensemble some extra flair! A Linen Suit can look great as casual wear during the Summer! 4. Cotton – For most men, cotton seems to be a default choice during the summer. However, with a vast selection of cotton on the world market, it is imperative that you have a discerning eye when choosing your summer fabric. Ideally, you want to go for an open weave, one that lets in air more easily during the summer months. If you cannot see through the fabric when holding it against the light in the summer, it is not well suited for warmer weather. If you are taller and slim, and looking to portray the desired ‘V’ shape look, opt for a peak lapel jacket! 5. Khaki – Khaki suits during the summer are a wardrobe essential. They are versatile enough to be dressed up or down! Buy them in a light weight fabric, and they are an ideal spring / summer option! What better way to spice up a Khaki, neutral colored outfit than with a splash of color with your shirt! 6. Plaid – Just as pinstripes are transitioning away from boardroom setting to more casual, as is plaid. With the renaissance of Plaid over recent years, the design has become versatile enough to be worn both during winter and summer months. For the latter, go with muted plaid that gives ensemble a more relaxed feel. To give your outfit some extra flair, mix it up with a checkered shirt, paired with a solid tie! 7. Light Grey Suit – Even if worn as a woolen suit, a light grey suit during the spring and summer months is a perfect choice. Given its neutral color, throw in any colored shirt with a funky madras cotton or animal print motif tie, and you have an overall package that will look both presentable and fun. A light grey suit looks best with brown shoes. Check out some of our favorite animal motif ties at The Dark Knot for the summer months! ‹ Which Shirt and Tie combination is your favorite?